As you probably already know, there are 14 new tools that I published in RSS feed and in the “What’s New” section of NirSoft homepage. Posted by NirSoft on April 4, 2018 at 3:49 am under Utilities Update. At this moment there are 10+ completely new tools hidden in NirSoft Web site. There is no any link to these new tools in NirSoft or in any other Web site. In order to find these new tools, you need to have some programming knowledge, understanding of Web technology, and other skills. First Stage – Finding the first tool. 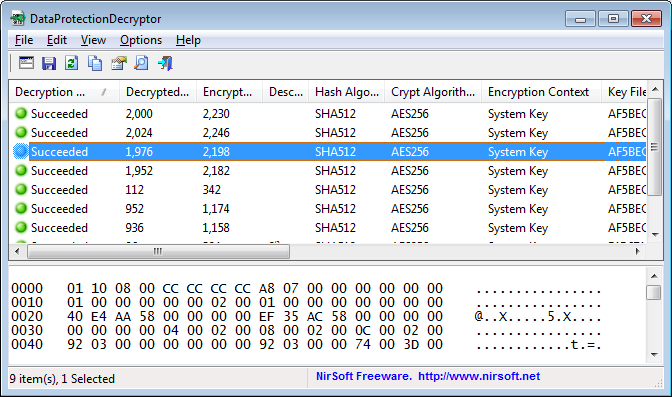 You can download a zip file with .exe files of all these tools from here. In order to decrypt the message, you have to XOR all bytes of every .exe file with 0x7f (127) and then search for a short message in English. It’s recommended to start the search from the end of the file and then move backwards, because the message is stored in the second half of the file. Also, when there are 32-bit and 64-bit versions of the same tool, it’s recommended to use the 32-bit executable file. In all tools except of one, the message is a short quote that somewhat represents my own personal worldview. Only in one tool you’ll find the real thing you’re looking for – a link to a Web page that contains a new tool ! Inside the Web page of the first tool, there is a clue that can lead you to the next tool. In order to find it, you need some understanding of Web technology (I mean – you have to look inside the HTML of this Web page). By looking for clues on every Web page of a new tool, you can eventually reach 10+ new NirSoft tools ! Be aware that the clues gradually become harder and more tricky and require different abilities (For example: Using NirSoft tools to decrypt encrypted information), so it’s possible that at some point you won’t be able to find the next tool. Also, in some of the clues there is an hint of TV shows and movies (Just for fun…). Share the links with others ! Maybe you’ll be the first one in the world who write about the new tools before anyone else ! Posted by NirSoft on March 27, 2018 at 7:08 pm under Utilities Update. A few months ago I had an idea to add ‘Easter Eggs’ into a few tools and then publish the information about how to activate them before Easter holiday. in multiple colors when pressing a specific combination of keys. Currently there are 15 tools that have this ‘Easter Egg’ feature, the idea is the same in all of them, but in every tool the colors effect is a little different. Hold down the Ctrl and Shift key while the tool is in focus. Pressing the same key combination again will switch the tool back to normal colors. before trying the Easter Egg key combination… Otherwise, you’ll activate these shortcut keys instead of NirSoft Easter Egg. if you find it, it means that the Easter Egg key combination is not available on this tool. After playing with painting NirSoft tools in colors, I had a new idea for another kind of ‘Easter Eggs’, much more serious than some colors in a window. In the next few days you’ll see the result of this new idea, I’ll publish all information about it in this Blog when it’s ready. Posted by NirSoft on March 26, 2018 at 1:46 am under NirSoft Tips. 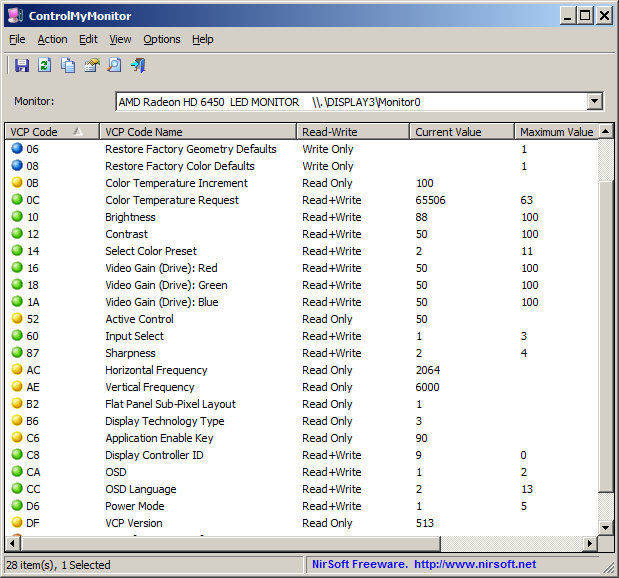 ControlMyMonitor is a new tool that allows you view and modify the settings of your monitor (Also known as ‘VCP Features’), like brightness, contrast, sharpness, red/green/blue color balance, and more… You can modify the monitor settings from the GUI and from command-line. You can also export all settings of your monitor into a configuration file and then later load the same configuration back into your monitor. Posted by NirSoft on November 12, 2017 at 4:48 am under Utilities Update. You can watch the installed software packages information from your local system or from another system on external hard-drive. Posted by NirSoft on October 23, 2017 at 11:16 am under Utilities Update. NetworkCountersWatch is a new tool for Windows that displays system counters for every network interface on your system. The system counters include the number of incoming/outgoing bytes, number of incoming/outgoing packets, number of broadcast packets, and more. You can also initialize all counters to zero at any time in order to watch the network counters for specific event. NetworkCountersWatch also calculates and displays the current download speed and upload speed on your network interface. Posted by NirSoft on September 22, 2017 at 6:49 pm under Utilities Update. 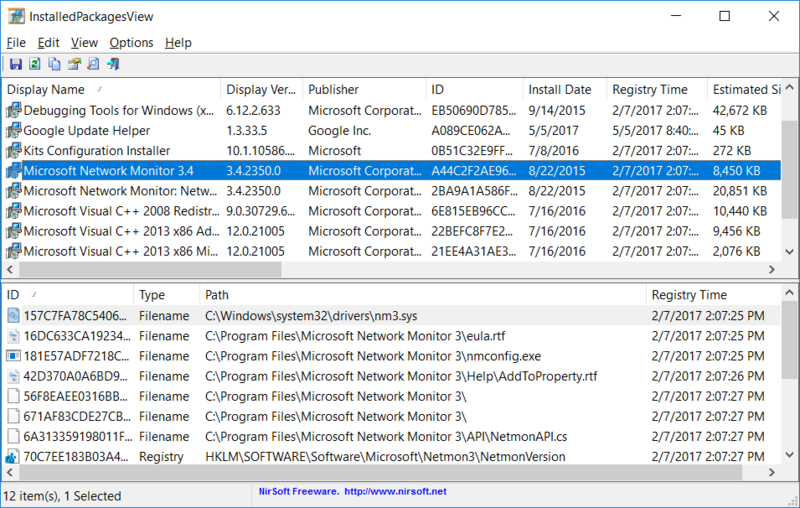 UninstallView is a new tool for Windows that collects information about all programs installed on your system and displays the details of the installed programs in one table. You can use it to get installed programs information for your local system, for remote computer on your network, and for external hard-drive plugged to your computer. It also allows you to easily uninstall a software on your local computer and remote computer (Including quiet uninstall if the installer supports it). UninstallView is designed to replace the old MyUninstaller tool. You can download the new UninstallView utility from this Web page. Posted by NirSoft on May 3, 2017 at 2:45 am under Utilities Update. DataProtectionDecryptor is a powerful tool for Windows that allows you to decrypt passwords and other information encrypted by the DPAPI (Data Protection API) system of Windows operating system. You can use this tool to decrypt DPAPI data on your current running system and to decrypt DPAPI data stored on external hard drive. You can read about using this DPAPI decryption tool in this Web page. Posted by NirSoft on March 15, 2017 at 6:00 am under Utilities Update.